Is there any meal more exciting than brunch? I spend many an hour looking forward to my next brunch discovery, or daydreaming about putting together a spread for a themed brunch at home (though I’m far too lazy ever to execute this plan). 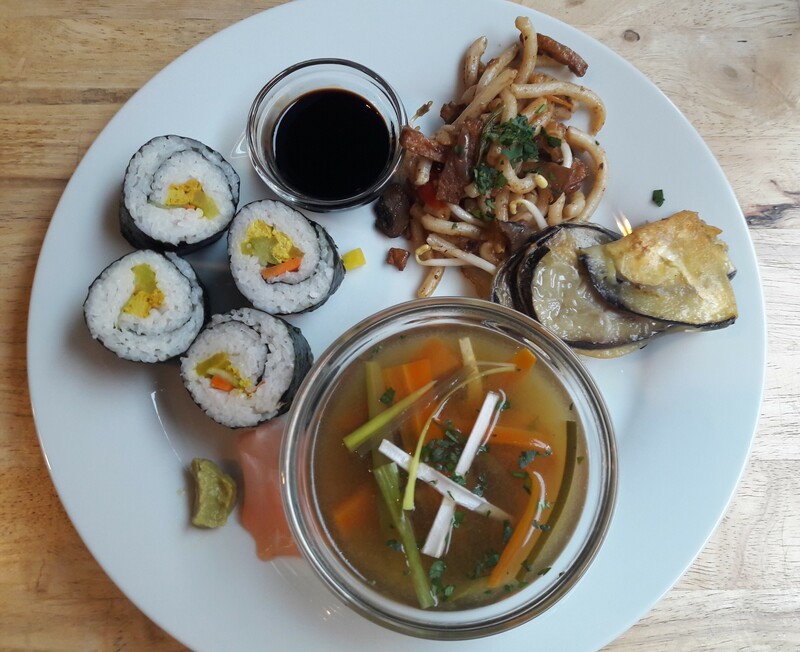 It is fortunate, then, that Prague really delivers on the vegan brunch front! Bistro Strecha doesn’t actually specialise in brunch – Monday-Friday it’s a regular vegan cafe with its daily lunch menu and a few regular items to choose from. 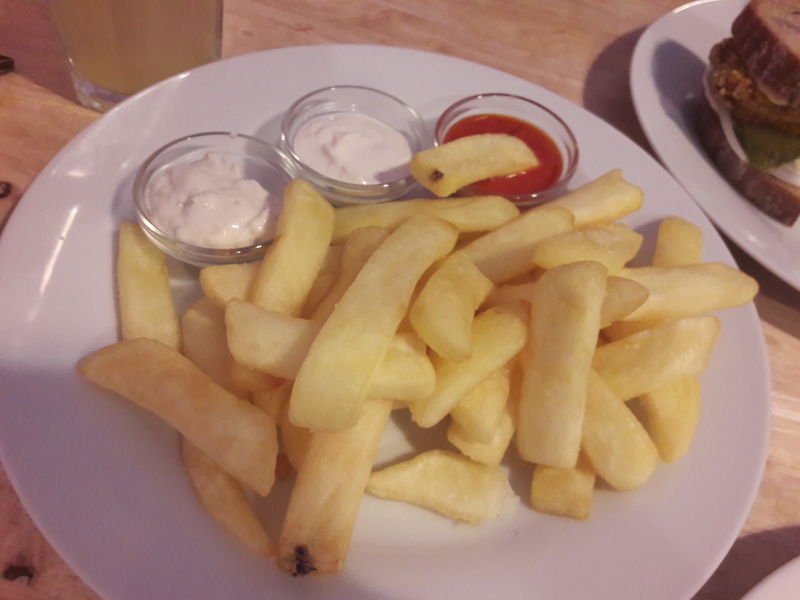 We’ve tried a few of those regulars before, including a very tasty shawarma, some pale but satisfyingly chunky chips, and a good cutlet sandwich. But on Saturday morning, thinks get really exciting as every week there’s a themed brunch. Who doesn’t love a theme?! The first one we went to was Harry Potter themed. I’m a massive fan, and last Christmas Dr HH found himself sitting through all eight films as they were shown on ITV (on consecutive days, not all in one sitting, of course) and was sort of won over, if only be Hermione’s clear superiority over her male peers. Altogether we were powerless to resist this brunch, and we were not alone – every seat was taken! Fortunately, we’d reserved a table. I don’t take chances when it comes to brunch! It was quite the exciting plate of food! There were two tiny, crisp pumpkin pasties, which I loved, and a St Mungo’s Bean Salad, which was solid. 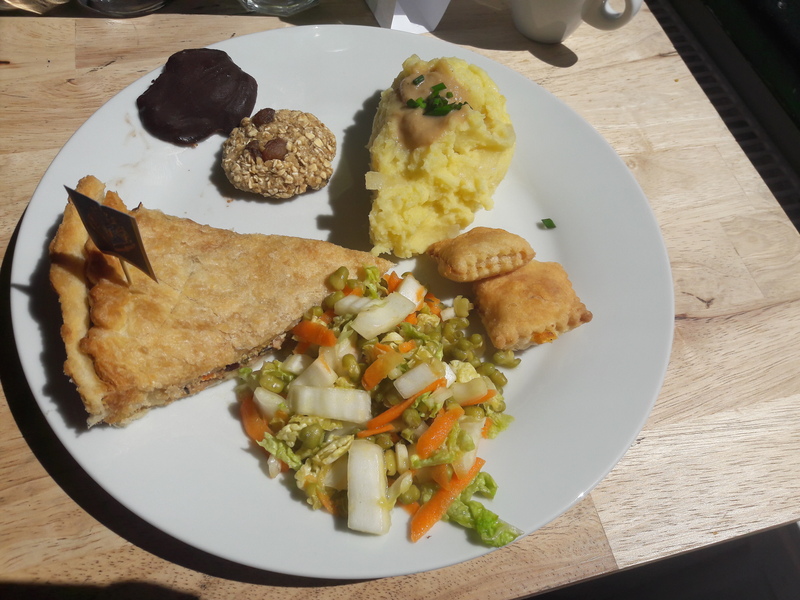 There was also mash and gravy with a steak and kidney pie (kidney beans and veg, it was absolutely delicious – probably the best thing I’ve ever eaten at Strecha), which I think are more British than specifically Harry Potter-ish. And we also got one of Hagrid’s cookies, and a chocolate frog. How magical! At Strecha you don’t choose one dish for brunch, you are just given a plate containing a bit of everything. I love getting to try everything, but I hate having sweet and savoury things together – especially as it was summer and the chocolate frog was melting into the savouries! Still, it was a really fun, well thought out meal, and we were even asked which house flag we’d like sticking in our pies. We asked for the general Hogwarts one but for the record, I’m a Ravenclaw. We returned a few months later for the Japanese brunch. This time it was a bit of a mixed bag. The miso soup was a bit bland, and we actually chucked the soy sauce in for flavour. And the tempura was absolutely awful – so slimy and oily, we could barely eat it. But the noodles were good, and the sushi was excellent. No dessert this time, which on the one hand was disappointing, but on the other hand at least there was no contamination risk! And most recently we went for the chanson brunch, thinking it was purely French themed but finding that there was in fact a live music element as well. This was another good one! The ratatouille looked quite watery, but was actually alright. It’s hard to be blown away by a ratatouille, but it was nice. 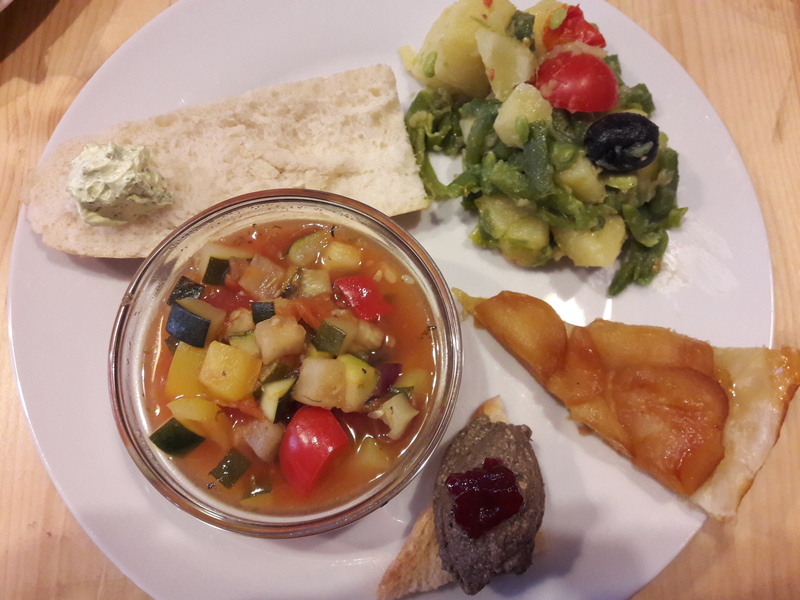 The nicoise salad was fun – I’ve only ever had it when I’ve made it myself from Appetite for Reduction, so it was nice to see what it should be like. I was excited to see garlic bread on the menu, and rightly so – the garlic butter was super creamy and super garlicky, so I was very satisfied. The mushroom pate was the highlight though, it was packed with flavour and on a nice crisp bit of toast. I managed to salvage the tarte tatin by quickly transferring it to the saucer from my cup of tea – phew! It was very good as well, with juicy apples and thin pastry – a much more elegant dessert than I would have expected at such a cheap and cheerful place. 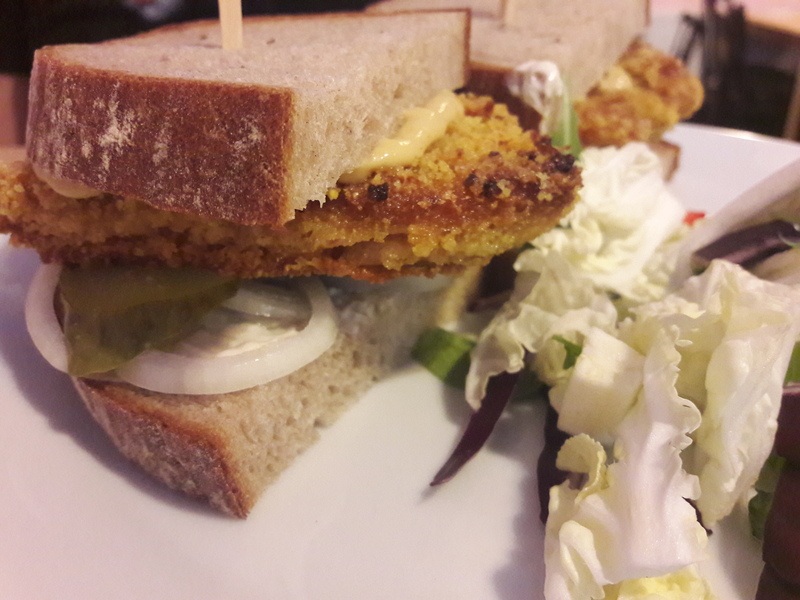 So if you are in Prague it’s always worth checking the Bistro Strecha Facebook page a few days in advance to see what that Saturday’s theme will be – they always have the full menu posted there. If you need any further convincing that you should go, Strecha is a kind of social enterprise which employs ex-convicts and homeless people, so it’s a good place to support. And if that didn’t seal the deal, please note that there’s quite often a dog curled up in a cosy armchair looking like it owns the place! 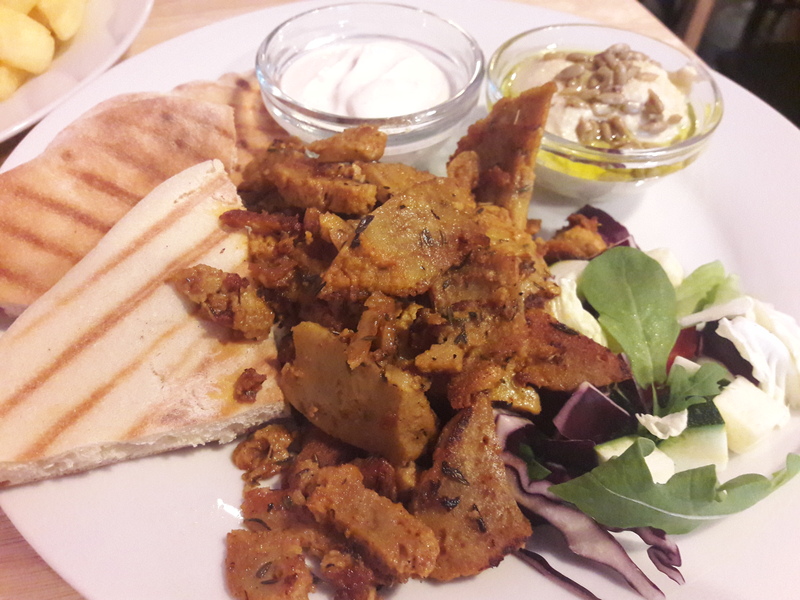 This entry was posted in Travel and tagged Bistro Strecha Prague, vegan brunch Prague, vegan Prague, vegan travel. Bookmark the permalink. Sounds really yummy! Was the Japanese themed plate a buffet? I ask because I know tempura is notorious for being very time sensitive. So much so that there are high end tempura restaurants in Japan where they make each item of the menu one at a time, making one dish and waiting till you finish before making the next. Ah, interesting. It wasn’t a buffet, but they served all things on the plate at once, so I can appreciate that it was difficult to work out the timing.